Darcie Little Badger – Robot Dinosaurs! My intern screamed. That’s rarely a good sign. Near the starboard rail, Abigail clutched a dripping, freshly towed plankton net. The collection vial dangling from the muslin funnel glinted in the sun, as if filled with silver particles. The collection vial was the size and transparency of a jam jar. Abigail thrust it at me, as if handing off a grenade. I activated the magnification on my protective goggles and peered at the murky seawater. Metal specks sloshed side to side, dizzying; they were shaped like pill boxes and propelled by nanocarbon flagella. I’d heard horror stories about swarms of bots large enough to track and disable cruise ships; they reported either to governments or pirates or supervillains, and we were in the open ocean, well beyond any continental jurisdiction. Pirates or supervillains, then. What did they want from us? The vessel was equipped for research, and our most expensive cargo was a really good microscope. Would they demand hostages? I glanced at Abigail’s back; she was nineteen, brilliant, and had joined my lab with a fellowship for low-income students. She reminded me of myself, twenty years back when, driven by hope, I studied geosciences because the world was hurting, and somebody had to diagnose it so something could done. Since then, I’ve made plenty of diagnoses. But so little has been done. I wondered how long it would take Abigail to become jaded or—like many of my colleagues—leave the field. It’s hard to make a career in geosciences unless you love the earth. Even harder to study its death in the kind of detail that withstands peer review. How many reefs had I watched die? Islands drowned by the rising sea? Primordial species extinguished in the span of one human lifetime? In the distance, a silver back split the sea, but the vessel—an odd submarine?—dove before I could get a good look. One of the quick-thinking deckhands activated a distress drone. With an industrious whir, the tri-copter zipped over my head and attempted to escape the signal-blocking radius emitted by those damnable bots. The ship’s emergency siren wailed, indicating that I should leave the deck and take shelter in my cabin. But I couldn’t turn away from the sea, which churned like boiling soup beneath the drone. Seconds later, a metal beast breached the water. Its great, crocodile-shaped mouth yawned open and snapped, crushing the drone mid-leap. Its four paddle-shaped flippers flapped, their surfaces sleek and their edges sharp as knives. When the whale-sized machine landed, the impact rocked our ship and sprayed my face with water that tasted of salt and metal. “What is that?” a deckhand asked, dismayed. The Liopleurodon head reared from the water, its jaws snapping, flourishing five-inch-long serrated teeth that could easily tear our hull to shreds. I took a step back, at once startled and fascinated. Its engineer had put exquisite care into the design, emulating the strength and form that once made the Liopleurodon the greatest carnivore in the Jurassic sea. 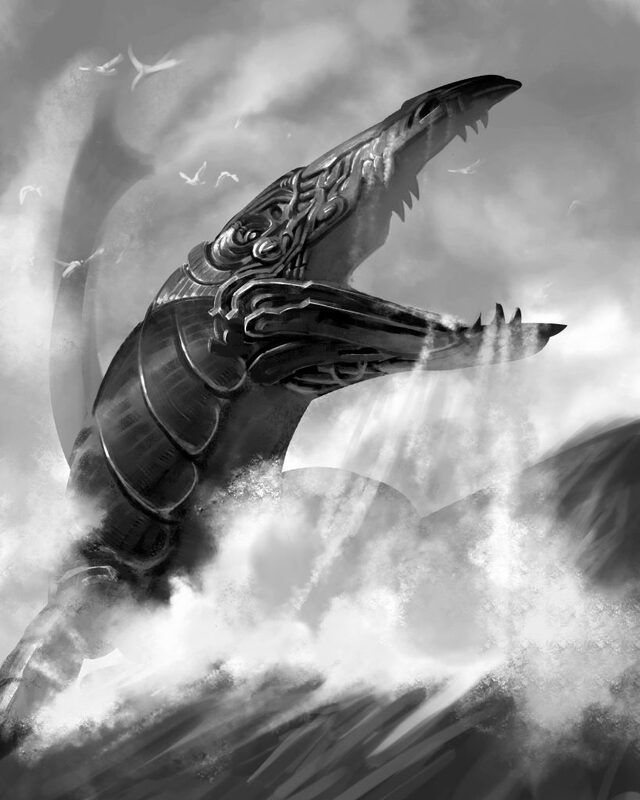 Far beyond the Liopleurodon, silver bobbed on the undulating sea. I zoomed in with my goggles and glimpsed a hatch protruding from a metal dome. There was something familiar about that voice. 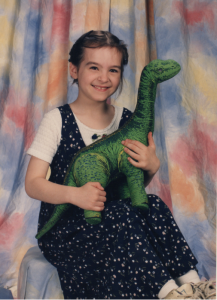 “Are you piloting that robot dinosaur?” I asked. I’d been wrong. My advisor never gave up. Although I wasn’t sure that joining a team of rogue scientist pirates was much better. And it had to be a team. Dr. Barbara might be a brilliant chemical oceanographer, but she wasn’t a paleontologist or an engineer. The Liopleurodon began to sink. “Wait!” I said. “You’ll be caught someday, Dr. Barbara,” I said. “Or something,” I said. And I wondered if someday that something would be me. Silver glinted against the horizon as the robo-Liopleurodon leapt one last time. The illustration is by Lars Weiler! Posted in original fictionTagged Darcie Little Badger, fiction, robot dinosaurs!2 Comments on Robo-Liopleurodon!